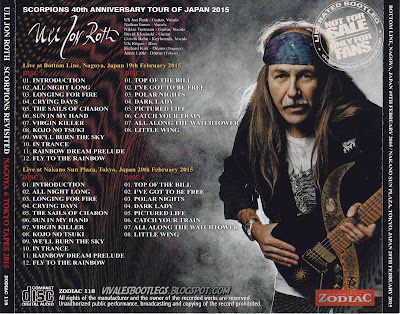 Recorded Live at the Bottom Line, Nagoya, Japan - February 19, 2015 + Nakano Sun Plaza Hall, Tokyo, Japan - February 20 2015. Files: 40.:: Size: 1.70 GB (flac). 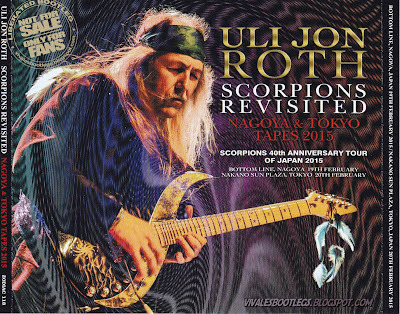 Personnel: Uli Jon Roth- Lead Guitar/Lead Vocals, Nathan James- Lead Vocals, Niklas Turmann- Guitar/Backing Vocals, David Klosinski- Guitar, Corvin Bahn- Keyboards, Ule W. Ritgen- Bass, Richard Kirk- Drums. Notes: 4 × CD, Limited Edition, Numbered, Unofficial Release. Uli Jon Roth latest Japan tour all three performances of the sound source is once appeared! Of the SCORPIONS 40th ANNIVERSARY TOUR OF JAPAN 2015, this work is the coupling title of the first day of Nagoya and second day in Tokyo. .. < (Info taken from Gig in Japan dot com; Translated Text from japanese) .